The Beckmann rearrangement is a reaction of oximes that can result in either amides or nitriles, depending on the starting material. The Beckmann rearrangement is an acid-catalyzed rearrangement of an oxime to an amide or nitriles, and cyclic oximes yield lactams. Oximes derived from ketones form amides, and oximes derived from aldehydes form nitriles. The Beckmann solution consists of acetic acid, hydrochloride acid, and acetic anhydride, and was widely used to catalyze the rearrangement. Other acids, such as sulfuric acid or polyphosphoric acid, can also be used. The Beckmann is the rearrangement of the oxime to the amide. This is achieved by converting the oxygen of the oxime to a good leaving group, an then heating. The formation of the oxime is technically not part of the Beckmann rearrangement. 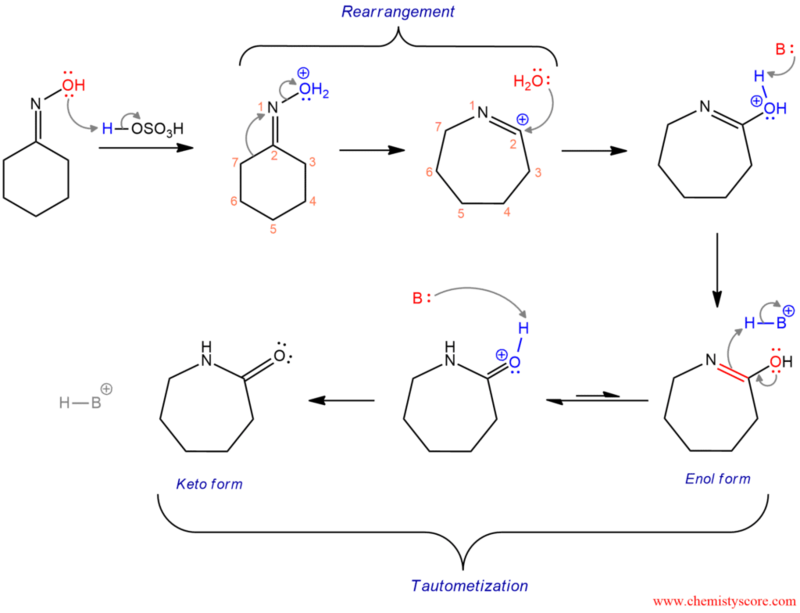 But here is the mechanism: In the first step, the nitrogen adds to the carbonyl carbon, followed by proton transfer. Then, the lone pair of nitrogen displaces the hydroxide in an elimination reaction and finally, the nitrogen is deprotonated by a base to give the oxime. The Beckmann rearrangement begins by protonation of the alcohol group forming a better leaving group (water). The oxime oxygen is protonated by acid (sulfuric acid in this case). Then comes the key step – rearrangement. To kick the leaving group out, the bond between 7 and 2 will shift it and instead of 7 and 2 it now bind between 7 and 1. And when that bond is shifted over then it is able to kick out the leaving group. The seven-membered carbocation is formed. The water molecule which is expelled previously attacks the carbocation and after deprotonation of the base (shown as a generic form :B), a neutral imidic acid is obtained. Imidic acid is a tautomer (enol form) of an amide, and the amide is the more stable form of this tautomer: The oxygen will push down its electrons to form carbonyl double bond, and existing double bond will break and pick up a hydrogen from the base. Then, again the base is going to remove positive charge by deprotonation and amide is formed as the final product. This example reaction starting with cyclohexanone, forming the reaction intermediate cyclohexanone oxime and resulting in caprolactam is one of the most important applications of the Beckmann rearrangement, as caprolactam is the feedstock in the production of Nylon 6.